Since man first began writing there has been a desire to send messages in secret: in code. Codes and ciphers are forms of secret communication. A code replaces words with letters, numbers or symbols. A cipher rearranges letters or uses substitutes to disguise the message. This process is called encryption. The art of writing and solving codes and ciphers is called cryptography. Codes and ciphers have been used throughout time when people wanted to keep messages private. Cryptography has, and is still, used by governments, military, companies, and organisations to protect information and messages. Today, encryption is used to protect data and data transfer between computers. Documents, data and messages are encrypted to protect confidentiality. Modern encryption methods are very clever but their underlying principles remain that of those ancient methods. I’m writing a unit of work on cryptography which will be published to iCompute for Primary Schools computing scheme of work. Here, the children will unleash their inner spy and learn about how data can be transferred in secret over distances. They will learn how codes and ciphers have been used throughout history and explore a number of different ways that data can be encrypted and decrypted. As part of it, I’ve been putting together resources on the history of cryptography. 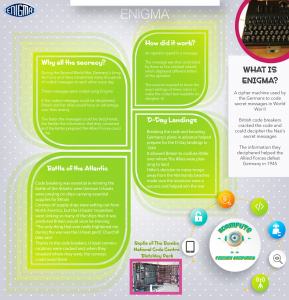 Here is a brief introduction to the Enigma machine and how the magnificent men and women at Bletchley helped shorten World War II with their code breaking skills! The new cryptography unit – iCrypto – is available now! Visit www.icompute-uk.com to find out more about our acclaimed primary computing scheme of work. Tagged Alan Turing, Bletchley, cipher, computing, crytography, data, data transmission, decipher, decryption, encryption, iCrypto, secret code, spy. « The Hour of Code 2017 is here!